I am enjoying my new watercolour paints and have watched some recent watercolour videos by the very talented Sandy Allnock. She has been playing around with the same paints (Kuretake Gansai Tambi) and posted a video last week where she created a faux glass panel inspired by vase she saw. I used some of the same techniques and made a faux marble panel. I painted blues, greens and purples on a piece of watercolour paper and let them blend. I dried them with a heat tool then added more layers leaving some pale and others dark and intense. When I was happy with the colours I painted some thin lines of gold onto the panel and blended them out on one side with a very wet paint brush. This gave me a soft edge and a hard edge I also splattered some gold paint over parts of the panel. The piece on the card above is less than half the watercoloured panel so I have some more to play around with another day. For the sentiment I stacked four diecuts of the word ‘imagine’ each with ‘stick it’ adhesive on the back to make them easier to stick together. The gold cardstock I used was slightly duller than the gold paint so I brightened it up with my gold wink of stella pen. I did the same with the sides of the card base so it would all match. I am thinking it might make a good graduation card. Gorgeous! I Imagine the universe being formed! – it’s so beautiful! Beautiful, simply beautiful! Reminds me of photos of a distant nebula. Oh my, another work of art. I LOVE your colors! This is just fabulous with rich color! I love the gold tones mixed within this wonderful creation! Gorgeous… look like sky storm… love it! I know it has been said before, but I will say it again – this is a gorgeous card. Love the colors and the touch of gold to match the sentiment. OMG – that is out of this world!!!!! I guess I have to watch tat video now… Stunning, stunning card!!!! Oh, WOW! That gold just makes this FAB!!! Thanks for the inspiration! Stunning! Is the gold watercolor paint too? The gold paint is one of the colours in the Gansai Tambi 36 watercolour set. Thank you for clarifying that…reminds me of the Polished Stone technique using Krylon pens & alcohol ink. Wow–so rich and beautiful and COSMIC! Thanks for the links to Sandy Allnock’s tutorials. She is amazing, too. Beautiful card. Really cosmic looking. Love it. Stunning. Love the colors, layers and the gold touches. This is so inspiring and so beautiful. Nice work. This is stunning! Love this! OMG. What a beautiful card. Took my breath away when I clicked on your blog. Beautiful…totally agree…could be a great graduation card! Just gorgeous! I do stained glass and this looks just like some of the glass in my studio. You have created a beautiful card. Just a stunning and beautiful card. I read a couple of posts about it being a grad card and I totally agree! Okay now. This is complete, fall off my chair, stunning. Words could never do this justice. I’m truly stunned at all of the beauty you managed to contain and create in this piece. Thank you. Gorgeous card and thanks for the links to the tutorial! I think this is just amazing Heather. You totally inspired me! Wow, what a great card !!! My first thought was, like others here, of photos of deep space. I have returned to this one 4 or 5 times. It is mesmerizing. Oh by gosh!!! I thought this was a picture from the hubble telescope! Unbelieveable!!! You need to make a video and post it!! I can see why this is a fan favorite! I watch your videos and examples, they are all wonderful designs and colours. It’s great that you are Canadian -makes me proud. I aspire to be able to design and paint like you. I buy Penny Black stamps and dies because of what you do with them. THANK YOU!!!!!!!!! Pat D from Ladysmith, B.C. Thank you for such a lovely message; I’m so happy you find my work inspiring. Hey Pat, we don’t live far apart. I’m just north of Qualicum Beach. Heather is SO very talented, isn’t she? 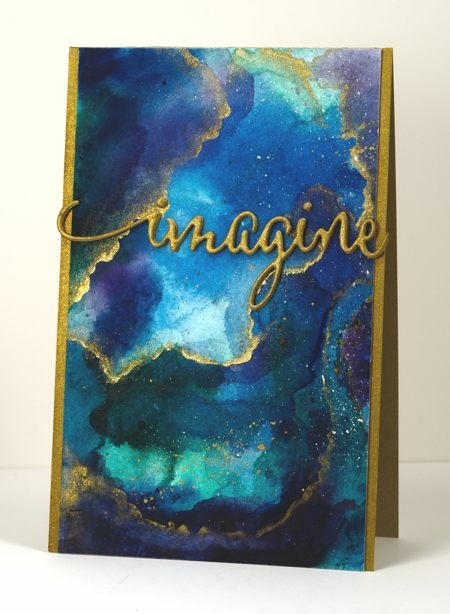 Heather, another pleased Canadian from Vancouver Island is jumping in to say that when I saw this card on Pinterest, I thought it was done with alcohol inks. To see this incredible beauty can be accomplished using those watercolours is unbelievable. I am such a fan of the blue spectrum & this card just draws me in to all that beauty. Thanks so much for posting it.